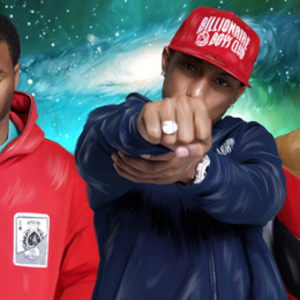 N.E.R.D (No One Ever Really Dies) is a funk rock, alternative rock and alternative hip hop band formed in 2001. Their music is best described as funk rock, with various other influences, including hip hop, R&B, soul, alternative rock, and blues. Pharrell Williams and Chad Hugo met in Virginia Beach, Virginia at the ages of 12 at a summer camp for musicians, which they both disliked. They spent their free time making beats and performing in groups with fellow childhood friend Timbaland. Shay Haley began performing with Williams and Hugo in high school. Pharrell Williams and Chad Hugo met in Virginia Beach, Virginia at the ages of 12 at a summer camp for musicians, which they both disliked. They spent their free time making beats and performing in groups with fellow childhood friend Timbaland. Shay Haley began performing with Williams and Hugo in high school. After watching the duo perform at a high school talent show, Teddy Riley, a musician and producer, signed Williams and Hugo in 1992. After producing songs for several artists throughout the late 1990s and early 2000s, the production duo formed N.E.R.D in 2001 as a side project.